The first thing I should say is that the Virtual World is really HUGE. There are so many things to do. That is part of the reason it has taken me forever to get this review out. I felt like I should really see everything before reviewing. Now I realize I don't think I'm ever going to have the time to see the entire Virtual World. There truly is that much to do. Plus... I swear every time we log in they've added something new. All of the areas and buildings are places you can go. There is so much I could say about each area... but if you're Zoe you spend all of your time at the Jumpee Creator and in Storyland for 3-5 year olds. There are also areas for 5-8 year olds and 8-10 year olds. Since Zoe is 4 we've tried to stick to the areas for her. Jumpstart really seems to know their age groups. The 3-5 sections are totally appropriate for Zoe... the 5-8 year sections she can try, but REALLY challenge her. The 8-10 sections are completely beyond her and don't do anything but cause her frustration no matter how much she insists she can play them. You get to design your character. Everything about your "Jumpee" you pick out... hair, clothes, eyes, shoes... it's all up to you. You can change your look and clothes any time you want and as many times as you want. Zoe will log into the site and sometimes do nothing beyond changing her Jumpee. 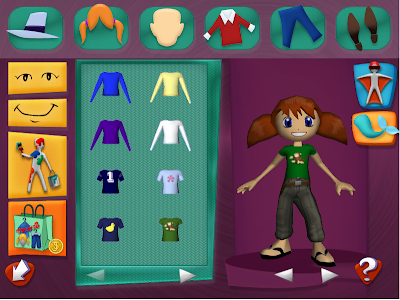 You can also buy new clothes with coins you earn while you play games. This area is a whole land in itself. 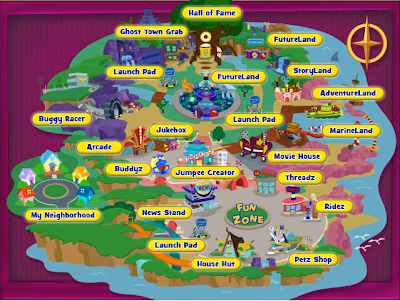 When we first started using Jumpstart.com I would immediately log Zoe into Storyland because the whole area is specifically for 3-5 year olds. Each of the different buildings has different activities... the schoolhouse has learning games, the clothes tent is another changing room, there is a movie house that plays short kids music videos, the library has story books to read. Hours of stuff to do... and no matter which building Zoe goes in the activities are age appropriate. 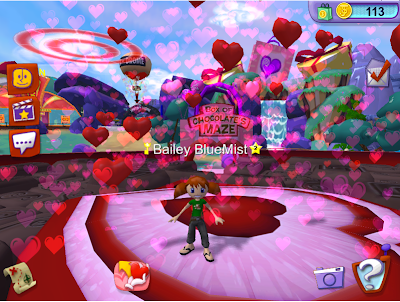 In addition to the usual virtual areas that are available... they currently have everything decorated and themed for Valentine's Day. They have a candy heart scavenger hunt going on... and a tunnel of love type swan ride. You can also send Valentine's if you have buddies to send them to. They have recently added a downtown area that has shops where you can spend your coins. (You earn coins when you play games.) They have a pet shop, a clothes shop, a "ride" shop, and a home store (Coming soon you'll be able to decorate your room!). 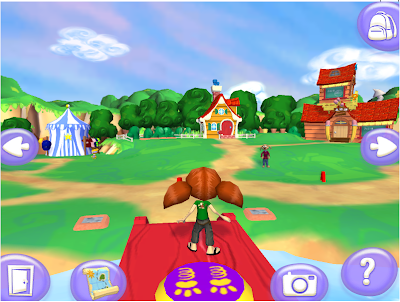 The shops really encouraged Zoe to play the games rather than wander around the World. She wants to buy a pet bunny to follow her around in the worse way. It costs 80 coins... and she now has 54. She went right back to matching numbers and letters so she could earn that bunny. And finally.... there is a buddy code. Your code is a personal code that allows you to get in touch with your real life friends. You can access your personal code and then share it with your family and friends. Then they can "meet you" in the Jumpstart World and chat and play. Zoe isn't really old enough for this yet.... but I imagine the 8-10 group would enjoy finding their friends for an online chat session. I can't really say how this works since we didn't access our buddy code. - I feel like it's a totally safe online environment for Zoe. - The games are educational... letter recognition, rhyming, counting. - It's set up in age appropriate areas. - There is a lot of variety. You get tired of Storyland... you head over to the arcade... or Marineland... or just wander around. - You have the ability to invite your friends to join your play. - I almost wish they would create a separate 3D Virtual World for each age group. I realize what a task that would be... but it would be nice if Zoe couldn't "wander" into areas with games for 8-10 year olds. She decides she MUST play the games once she sees them... and it just ends in frustration for her and for me. - I think it's a little pricey. My trial membership is running out. I could see doing $7.99 for a month or so... but I don't think I would do a year membership. Definitely not a "lifetime". - There is a lot of loading. If you have a slow computer it gets frustrating waiting for each individual land or game to load. Fast computer... no problem. If you want to learn more try it out for free. You can also check them out on Facebook and Twitter.